This will be a series of ongoing articles about the 7 themed lands and rides in Universal Studios Singapore. Pictures courtesy of Universal Studios Singapore Press Conference. One of the most exciting and most well covered land is the Sci-fi city. It is one of the smallest lands in the whole of Universal Studios Singapore and undoubtedly one of the best lands in Universal Studios Singapore as it houses 3 headliner, gate-busting attractions. 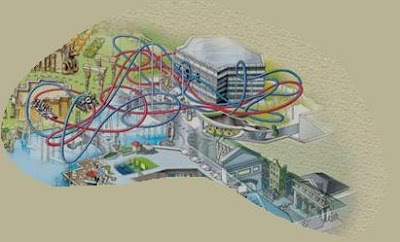 The Battle Star Galactica Human line, Battle Star Galactica Cyclone line, and the Transformers ride opening in 2011. -The coaster will be launched from their stations at high speed instead of the traditional chain lift. -Each coaster feature either several inversions, a zero-g roll, a Cobra roll, corkscrews, vertical loops and near collisions mere inches apart. -Part of the ride will take place over a lagoon. This ride will also feature a new generation of interactive storytelling queues, where there will be different sides of the story of Battlestar Galactica told on the two queues. This ride will be like the spinning tea cups on steroids, with a futuristic themeing. It is mainly a children's ride.